No more waiting ever for a table at your favorite restaurants! How many times have you been to your favorite restaurant and realized that there is going to be a wait to get seated at a table? How many times have you decided not to go to your favorite restaurant just because you know you will be waiting for a table? All this ends now with the new Got Table App! Searching by GPS positions for a restaurant by name,cuisine type, zip code. Displays Real Time with a Special Offer icon on the Restaurant with the most current deals being offered. Exploring new restaurant without having to wait for a seat. Many great restaurants at your fingertips to choose from! Don’t wait any longer for a table at a restaurant and start enjoying a better dining experience! 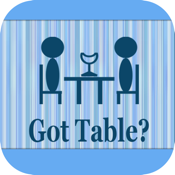 Got Table App (Patent Pending) is currently rolling out in the Southern California area and will be coming soon to a city near you! Please check the website http://www.gottableapp.com for the latest update. "The copyrighted subject matter of the GOT TABLE? Application includes all screen shots and their content."